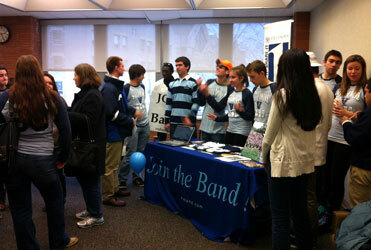 To welcome prospective and early accepted Villanovans, on Feb. 16 Falvey Memorial Library successfully hosted the “Activities Fair” for Early Action Candidates’ Day. The first two floors of the Library experienced an atmosphere full of energy and excitement. Sixty student groups, clubs and societies animated the normally tranquil Saturday in the Library, showcasing their active involvement on campus to the young Wildcats. New candidates and their families had an opportunity to explore a plethora of activities, be they academic, multicultural, ROTC-related or service-oriented. Representatives from Residence Life and the Career Center also presented our new members with insights for on-campus accommodation and support for their professional objectives. This was the first time the Library had ever accepted the responsibility to host such a large event. 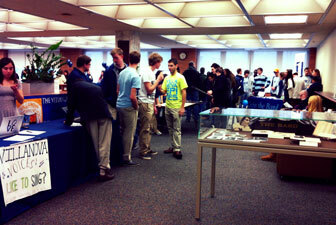 However, our library staff members were delighted to see the exceptionally positive turnout of the Activities Fair. We look forward to hosting similar successful events in the future. If you would like to request a venue for your event with us, please visit our Events Homepage for more details or fill out our Request a Venue form to secure a space for your next event! Minh Cao is a graduate assistant with the Department of Communication and works as an intern for Falvey’s Scholarly Outreach team.